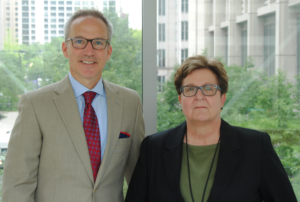 Daniel Brat, MD, PhD, chair and Magerstadt Professor of Pathology, and Eileen Bigio, MD, the Paul E. Steiner Research Professor of Pathology, will serve as president and vice president of the American Association of Neuropathologists. The American Association of Neuropathologists will be headed by two Northwestern Medicine faculty for the 2019-2020 term — the first time in the 95-year history of the organization in which both the president and vice president hail from the same institution. Daniel Brat, MD, PhD, chair and Magerstadt Professor of Pathology, will serve as president and Eileen Bigio, MD, the Paul E. Steiner Research Professor of Pathology, will serve as vice president. The appointments were announced at the American Association of Neuropathologists (AANP) 94th Annual Meeting, held in early June in Louisville, Kentucky. Brat and Bigio will design the schedule and curriculum for the upcoming AANP 96th Annual Meeting, to be held in Monterey, California in 2020. Brat said that his expertise in brain tumors and Bigio’s experience with neurodegenerative diseases will ensure inclusion of the latest ideas from two of the biggest areas of neuropathology. In addition, advances in molecular genetics will be of particular focus in a special day-long course. The advent of efficient whole-genome screening and other molecular techniques have contributed to a deluge of information about why mutations occur and what downstream effects they have, explained Bigio. In addition to the day-long course on molecular genetics, the meeting will feature continuing education courses and presentations from neuropathology leaders across the world. Read about some of Bigio’s previous work on Alzheimer’s disease, and a profile of Brat published in Northwestern Medicine magazine.